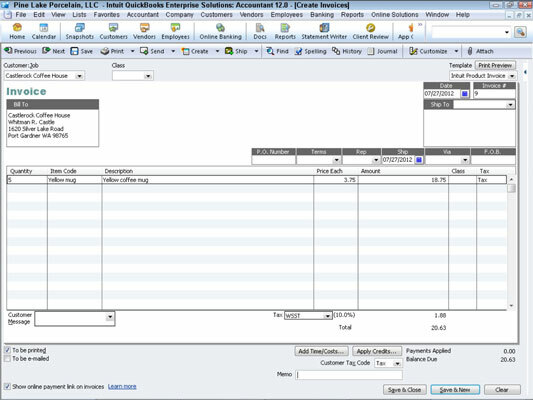 After you turn on Class Tracking in QuickBooks 2012, using classes is really straightforward. You set up classes for the product lines or service lines for which you want to measure profitability. You classify transactions as fitting into a particular class either as they’re recorded (if you can) or after the fact (if you need to fiddle with the activity and cost driver math). 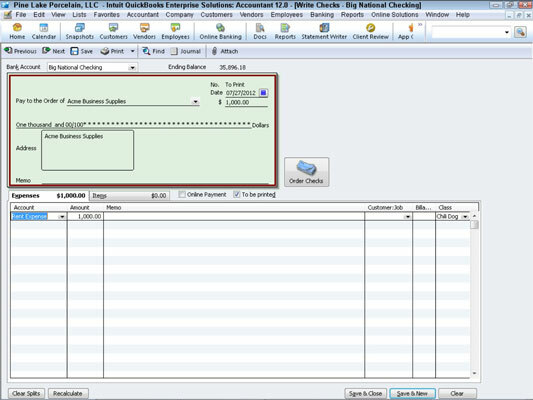 You set up a class for each product or service for which you want to measure profitability. In an imaginary hot dog stand business, for example, you set up two classes: one for regular hot dogs and one for chilidogs. To set up a class, you can just enter the class name into the class box that appears on the window that you use to record invoices, write checks, and make journal entries (these windows are shown later in this section). Alternatively, you can choose the Lists menu’s Class List command. 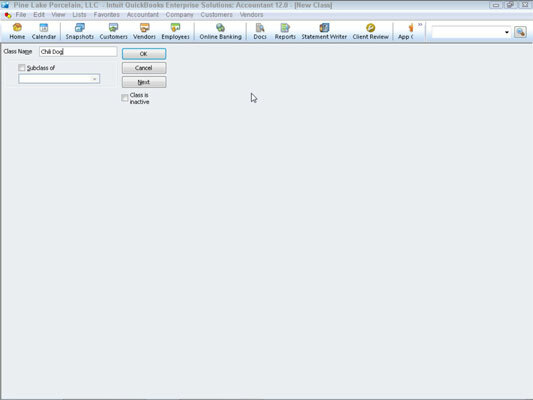 When QuickBooks displays the Class List window, click the Class button shown at the bottom of the window and choose New from the menu that QuickBooks displays. Use the New Class window that appears to describe the new class. If an invoice records sales of a hot dog, for example, you may record the class as Regular. If a sales receipt records sales of a chilidog, you may record the class as Chili Dog. Here, the Create Invoices window is filled out to record the day’s regular hot dog sales. The Class box is in the upper-left corner of the window close to the Customer:Job box. To record a check that pays some expense that fits into a particular activity, you also use the Class column — this appears on the Expenses tab — to identify the product line or service into which the expense fits. The Write Checks window may appear to record $1,000 of rent expense allocated to the chilidog product line. 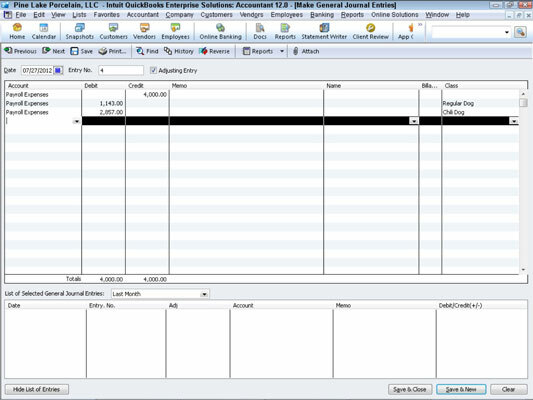 The Class column is located along the right edge of the Expense tab. In some cases, you won’t be able to classify an expense or revenue amount at the time the initial transaction is recorded. For example, in the hot dog stand example, you probably won’t be able to figure out how to split the wages expense between regular hot dogs and chilidogs until after you pay the employees. The same thing is true of the supplies expense. In both cases, you need to know how many regular hot dogs and how many chilidogs you sell before you can allocate, or trace, supplies and wages. In these sorts of cases, you use the Make General Journal Entries window to classify previously unclassified expenses. The following figure shows you how to take $4,000 of previously unclassified wages expense and allocate the amount to the regular and chilidog product lines. The Class column is located along the right edge of the General Journal Entry window. After you allocate as much overhead as you can to the product or service lines, you can prepare a profit and loss statement by class that shows the profitability-by-product-line data. To produce a profit and loss statement by class, choose the Reports→Company & Financial→Profit & Loss by Class command.